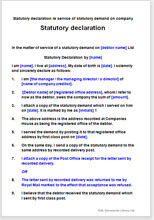 Official statutory demand forms, examples and notes. Simple and effective debt collecting device. If you issue a statutory demand, you can follow it up 21 days later with a winding up petition. There is nothing, but nothing that concentrates someone’s mind more than prospective wipe out. Of course, if you have done your homework, you never need to issue the petition. The procedure is very easy to follow. All you need are a couple of forms and a stamp; no solicitors, no court fees. any person or company for use in the recovery of money.